﻿ If you need more Taco Tuesdays in your life, then you’re in the right place! I’m currently filming the entire taco series to go along with the recipes inside my Taco Tuesday Cookbook which I share over on my Youtube channel. You, me, tacos- can it get any better? Maybe if I had these fish tacos RIGHT NOW! Aside from their incredible taste, fish tacos are among the more simple recipes in the #tacoteusdaycookbook. It doesn’t take a whole lot of work or fancy cooking skills to create the perfect fish taco, only simple and fresh ingredients. 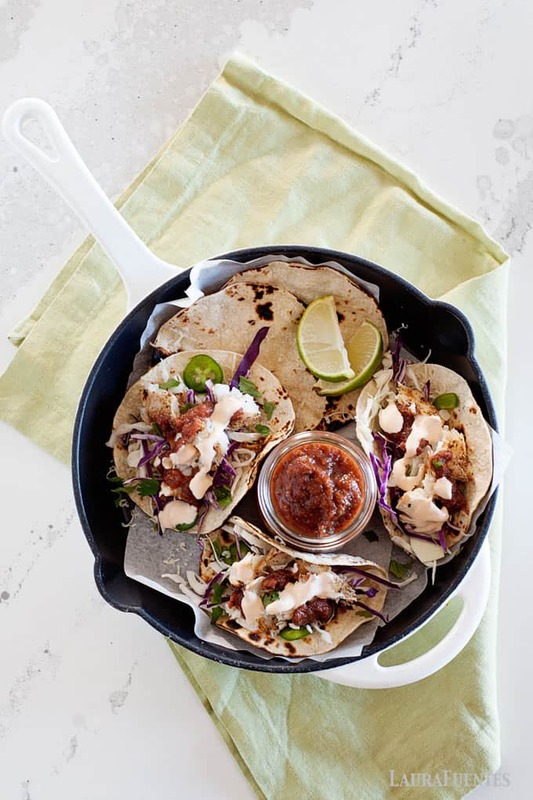 Fish also cooks A LOT faster than other proteins, like beef or chicken, so if you need a quick weeknight dinner or want to impress your party guests, go for fish tacos. Because good fish tacos are life-changing. The recipe name says grilled but we actually do all the cooking in a skillet. Two reasons: no one wants to fire up a grill 6 six o’clock on a weeknight much less clean charred fish flakes off grill grates. Plus, cooking the fish in a hot skillet is actually the key to getting a crispy crust while keeping the meat tender and flaky! Hug that delicious fish with a warm tortilla along with crunchy slaw and creamy cilantro dressing… are you still with me? 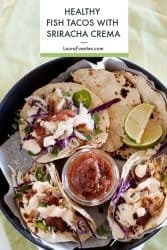 Now, for some of you, cooking fish on the stove can be intimidating, but I’m about to bust that fear by sharing my secrets to making the best fish tacos at home. For this recipe, we are using mahi-mahi fillets. It’s one of my favorite types of fish to cook and eat and has a firm texture with large flakes so it holds up well when cooked stove-top. Fresh or frozen, it’s your choice. I opt for frozen, it’s more convenient to store and allows me to always keep fish on hand for recipes like this. 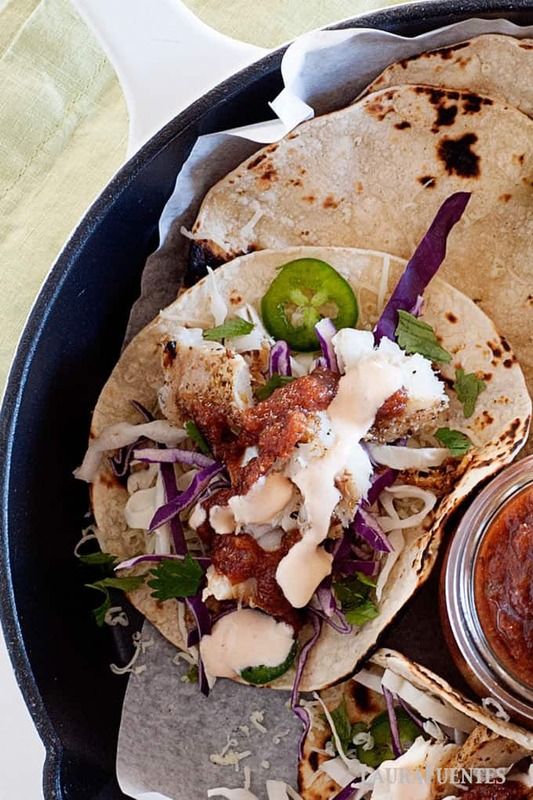 Another option for great fish tacos is Cod fillets. They are also thicker, meatier, and they flake wonderfully for a perfect taco. 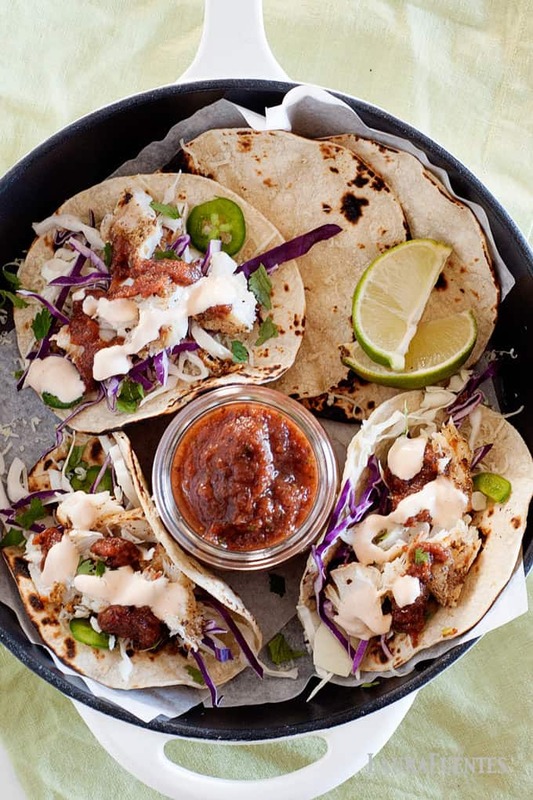 Other options for quick skillet fish tacos are tilapia, flounder, grouper, and snapper. One thing to note that the thinner the fish, the quicker it will cook. Start with a HOT greased pan. Seriously. Your pan should sizzle when or if a few water droplets hit the surface. As soon as the fish fillet hits the pan, the surface will sear and lock in the moisture. 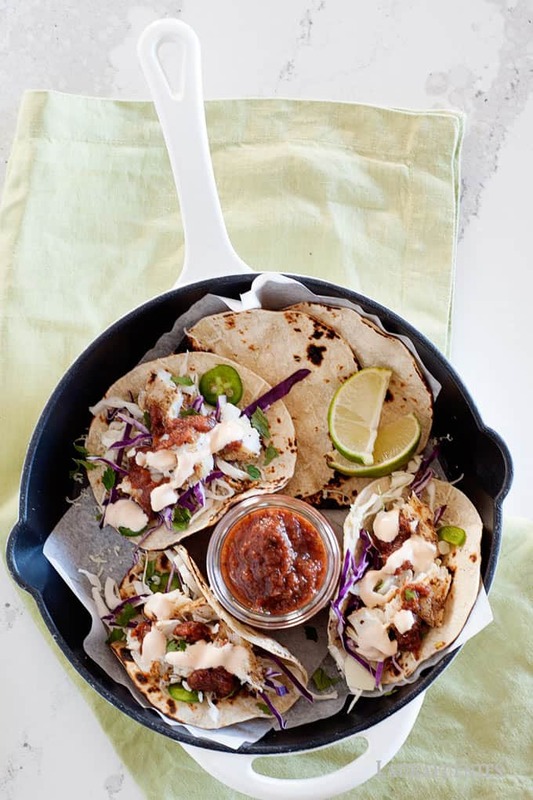 I like cooking up my fish tacos in a cast iron skillet pan but another great option is a stainless steel pan. With these cooking materials, you’ll have to grease the pan, place the fish, and let the fish cook on the first side until it lifts easily. Lifting the fish before it’s ready will break it up and make a mess. I’m not a fan of non-stick skillets for fish tacos because it doesn’t heat up as hot and does not create as delicious of a crust. In addition, most of us get impatient with our fish when the skillet is non-stick and therefore turn it before we should. Now let’s talk about this Taco Tuesday’s drizzle, Sriracha sour cream or as I like to call it- liquid gold! It’s a creamy, smoky dressing with a kick of spice that’s perfect for these fish tacos. The secret to the sauce is my homemade Sriracha seasoning. It is THE magic fairy dust for all foods, chicken, fish, beef, stir-fry, the list goes on. 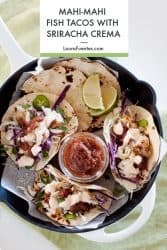 I love making interesting sauces and dressing for tacos because there is always enough leftover for me to use later in the week on salads, in wraps, or sandwiches. 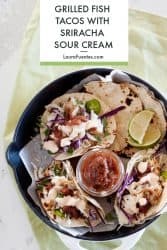 But I gotta say, the Cilantro Lime dressing and this Sriracha Sour Cream are among my favorites from the #tacotuesdaycookbook. So if you want your day to consist of amazing fish tacos check out the Taco Tuesday Cookbook and make sure to keep up with the latest taco recipe on my Youtube Channel. See you soon!